Director/Screenplay – Victor Salva, Producers – Daniel Grodnik, Robert Snukal & John Tarnoff, Photography – Levie Isaacks, Music – Bennett Salvay, Production Design – Stephen Greenberg. Production Company – Itasca Pictures. While driving through the California desert, businessman Jack Powell passes a hitchhiker but neglects to stop. Later in a diner, the hitchhiker Adrian comes up and accuses Jack of unfriendliness. Jack offers to buy him lunch as way of apology. Adrian treats the waitress crudely and Jack later finds her dead, the latest victim of a serial killer travelling across the area who leaves the phrase ‘Hatchet Man’ written on his victims’ vehicles. Adrian then forces his way into Jack’s motel room, taking the sparkplugs from his car and taunting Jack with threatening to expose what he has in his steel briefcase. He makes Jack take him as his passenger. Their journey becomes a tense series of psychological games – Jack certain that Adrian is the Hatchet Man and Adrian certain that Jack’s briefcase contains a million dollars that were stolen from a Vegas casino. Victor Salva was one of the more promising and underrated genre directors to emerge in the 1990s. Salva premiered with the haunting, highly underrated slasher film Clownhouse (1989) and then went onto the gifted teen film Powder (1995) and the non-genre thriller Rites of Passage (1999), before having the modest hit of Jeepers Creepers (2001) and its even better sequel Jeepers Creepers II (2003), the non-genre philosophical film Peaceful Warrior (2006), the stalker film Rosewood Lane (2011), the deviltry film Dark House (2014) and Jeepers Creepers 3 (2017). The Nature of the Beast is one of Victor Salva’s best films, although it criminally received next-to-no release when it came out and only surfaced on video. It is, when finally tracked down, a surprisingly good film. Victor Salva is a self-confessed horror film fan and all of his films lurk with an undertow of repression and psychological game playing. The Nature of the Beast is a road movie psycho-thriller. It is one where Salva clearly references familiarity with other films in the genre. There is the person driving across the desert with the (possibly) stolen briefcase of money taken from Psycho (1960); the milquetoast salesman driving through the desert whose life is turned upside down from out of the blue as in Duel (1971) (a film that Salva references even more so in Jeepers Creepers); and the tense, uneasy series of psychological games between the driver and the hitchhiker from The Hitcher (1986), which The Nature of the Beast owes much to. Victor Salva does an excellent job of creating a perpetually off-centre state of uncertainty about the games being played. The film hovers in a state of ambiguity – did Lance Henriksen steal the $1.25 million from the Vegas casino and is this what he is keeping hidden is in his steel briefcase? Is Eric Roberts the Hatchet Man? Eric Roberts always has a cocky, dangerously macho presence on screen irrespective of the role and is well cast here. His best performances are those that play into this macho swagger – the other great one he gave was as Dorothy Stratten’s boyfriend in Star 80 (1983). 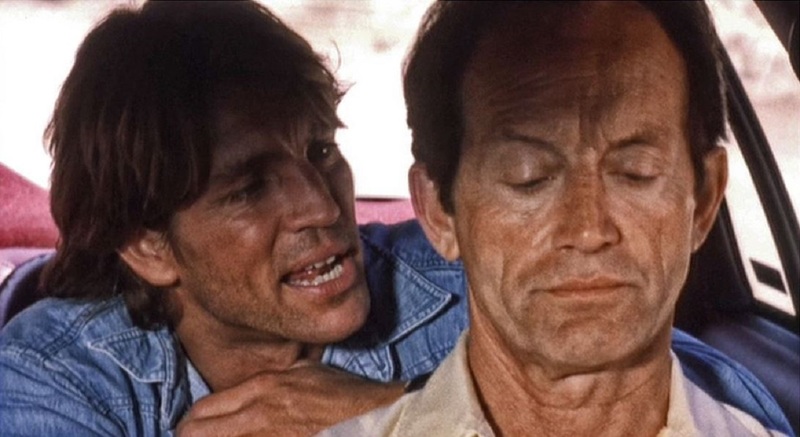 Here Roberts does an uncomfortably good job of taunting the mild-mannered Lance Henriksen and the fun in the film comes in watching the two manoeuvring around one another and even colluding. Victor Salva generates an incredible degree of tension in a number of scenes – where Eric Roberts produces a gila monster and throws it at Lance Henriksen while he is driving along the highway; where Roberts befriends the teen couple and Henriksen hovers around, clearly wanting to stop something bad from happening; and an incredibly tense scene where the freshly-buried grave starts stirring just as the sheriff comes to pay a visit. The scene near the end where Eric Roberts remonstrates Lance Henriksen on the meaningless of life and Henriksen tries to kill him with an overdose is startling, none the more so for the potency of the soliloquies that Victor Salva writes during these scenes. The ambiguity is eventually resolved in a twist ending that plays against the expectations that have been built up with an effective surprise.